There’s nothing quite like finding a piece of clothing that perfectly reflects the season, day and mood you’re in. Mid-April feels like a whole lot of breezy polka dot peplum tops to me, wouldn’t you agree? This delicate blouse was just what a lovely stroll outside, on the way to lunch at one of my favorite Tex Mex spots, called for. If you can’t tell by the pictures, the polka dots aren’t just a print… rather, they’re tiny fringed appliqués! A darling, expensive look that appearss far nicer than it’s $30 price tag! I stopped into H&M last week and proceeded to make a huge haul… that’s why you’ve been seeing so much of the store on my blog this week! Unfortunately, I’m quickly learning that H&M sells out quick. This top in particular doesn’t seem to be available online, but I’d recommend checking in-store. I’ll keep you updated if I see it’s restocked! such a cute look Kate. I have the same top and wore it just yesterday on the Blog haha. Love the little pom pom details on your blouse! 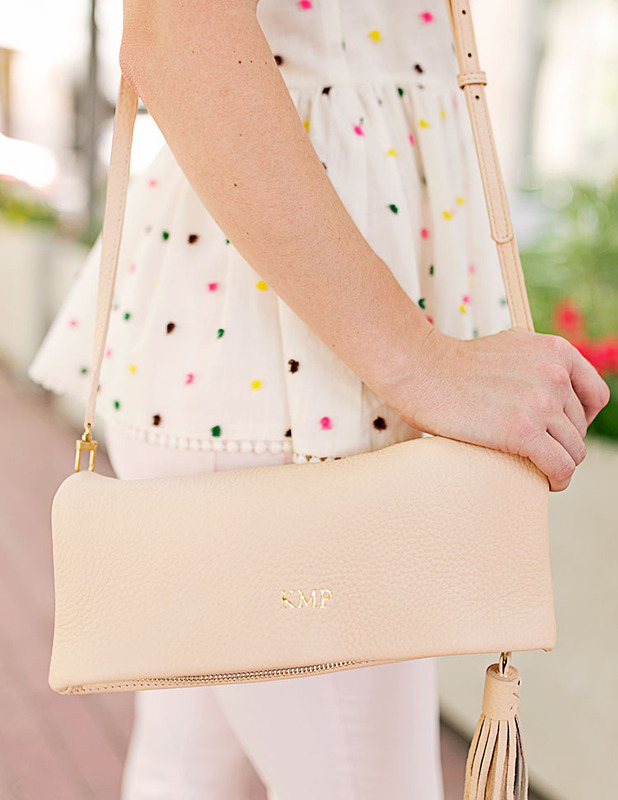 So darling and perfect for warm weather! Loving the wedges too! What an absolutely darling top!! So many beautiful details. H&M has some great gems, but you’re right .. I wish htey didn’t sell out so quickly online! Probably because they’re offering great deals on adorable things! What a cute “lunchin'” outfit this is! I love this outfit! The top is so cute and your bag is amazing! This is a perfect Spring outfit! I love the top- the dots are the perfect accent to add some color to the look! Your top is too adorable and I love that you paired it with pale pink pants instead of a white pair, which I think makes the whole outfit even cuter! What a lovely outfit. We really like your pictures and style. Continue the great work! Love this outfit, the top totally reflects the season! Love your top, Kate! It’s so cute! This tank is the cutest! I always love your outfits. Gorgeous!!! I love the simplicity of this look. Those little polka dots are adorable. You look gorgeous! I love the polka dot top! Oh my goodness, this top is to die for! I’m also loving all of the light white and beige tones! That tops is gorgeous, Kate! So pretty!